The Cerato is a smart choice if you are looking for an affordable family sedan due to its competitive prices, affordable running costs, and practicality. *Prices and features as provided by NATCO. Kia's exclusive dealer in Lebanon. 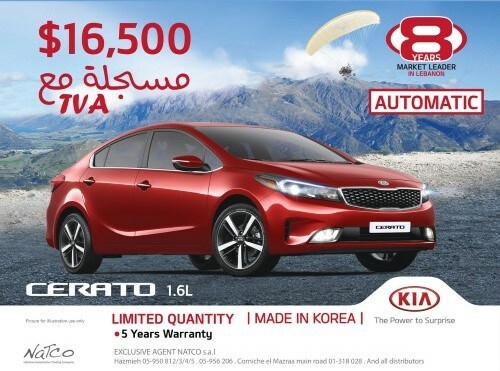 The Korean Cerato is a medium family Sedan which offers one of the lowest starting prices v/s its competition. No. The car displayed is the full option model detailed in the next section. Our preferred choice will always include the pick with the recent tech features such as the screen and the rear camera. The Full options model is worth its price, especially that you'll also be having the essential safety features (ABS/Double Airbags) as well as exterior improvements. However, the Cerato is also made to fit shoppers on a smaller budget. You'll still be getting good convenience features with the lower grades, although not all safety features will be available. We advise that you go for the one with ABS or the full options model, to have at least some sort of safety features in your new car.